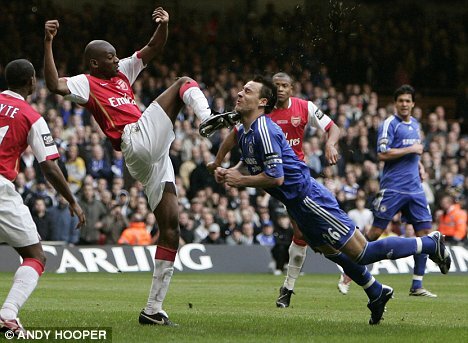 Arsenal's last League Cup final saw Abou Diaby knock out John Terry. Always a plus. Despite the result. I can't imagine it was Arsenal that asked for their match against Stoke to be rescheduled for days before a cup final, but that's what the league decided, and as such, injury news is the topic du jour. 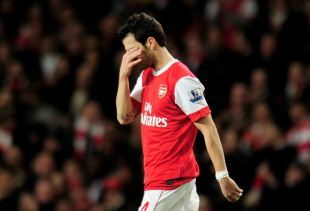 Unfortunately, the news about Cesc Fabregas's hamstring is not good; he will not be fit for Sunday. From there, Arsene Wenger won't say, though it seems to not be "three week" serious. Theo Walcott's ankle sprain, however, could see him out for a week or two. He misses the cup final as well. Selections for the side are a bit of a question with two parts of the attacking midfield out. Andrei Arshavin will start on the left, for sure, but how the middle works is anyone's guess. Either Tomas Rosicky starts in the middle, pushing Samir Nasri to the wing, or Nasri starts in the middle and Nicklas Bendtner starts on the wing. Pick your poison? Arsenal does have a trio of players returning from injuries as well. Robin van Persie (hamstring) and Laurent Koscielny (back) were kept out of the Stoke match as a precaution and will slip right back into the starting XI. In addition, Abou Diaby returns from both a calf injury and suspension. Lukasz Fabianski and Thomas Vermaelen remain long term injuries with the former done for the season and Vermaelen maybe coming back when the stars align properly, or something. The Blues are battling for only their second top flight trophy in club history (the first being the League Cup in 1963) and the automatic European qualification with which it comes. Birmingham City lost this cup final to Liverpool on penalties in 2001. Former Gunner Alexander Hleb is facing a late fitness test after picking up a knock to his knee in the FA Cup last weekend. Also slightly doubtful, but likely to return from their injuries are Cameron Jerome, Liam Ridgewell, and Martin Jiranek. James McFadden has missed six months with a knee injury, but is about to return to training. Scott Dann is out for the season with a hamstring tear and Enric Valles is out with a foot injury, though he's a youth player. Arsenal are currently unbeaten in 11 competitive fixtures; their last loss came in the first leg of the semi-final of this competition. The Gunners have outscored their opposition 13-2 in the Carling Cup this season, having kept three clean sheets in five matches. Birmingham City have had a strong season in both domestic cups, but are still just keeping their head above water in the league; they currently sit in 14th. In 26 league matches, Birmingham have won six. In nine cup ties, they have won seven and won the drawn Carling Cup tie on penalties. Jack Wilshere was sent off against Birmingham in October. Since the Eduardo incident, there has been quite a bit of bad blood between Arsenal and Birmingham City. Lee Bowyer escaped punishment, at the time, for at least two stamps on Bacary Sagna when the sides met at St. Andrew's on New Year's Day; Jack Wilshere was not so lucky for a wild tackle on Nicola Zigic at the Emirates in October. Arsenal won both league meetings against Birmingham this season. At the Emirates, Zigic grabbed the lead for Birmingham before Nasri leveled from the penalty spot and the quick footwork of Marouane Chamakh won it just after the restart. Arsenal was able to coast at St. Andrew's; Robin van Persie scored on a deflected free kick in the 13th minute, Samir Nasri added some comfort around the hour mark, and an own goal closed the scoring in Arsenal's 3-0 win. Overall, Arsenal are unbeaten in eight against Birmingham City. This is Arsenal's seventh League Cup final; they have won two and lost four. Their last League Cup win came in 1993 over Sheffield Wednesday. Birmingham has won one League Cup final and lost the other, both mentioned above. The referee, unfortunately, is Wirral-based Mike Dean. Arsenal have, as you probably noticed, not performed well with Dean in charge lately, though they did win their last match in which he was involved (the FA Cup replay at Leeds.) Before Nasri's early goal in that match, Arsenal had not scored a goal with Mike Dean as referee since Cesc Fabregas scored in the 7th minute at Burnley in December of 2009. Their opposition in Mike Dean matches kept four clean sheets in a row against the Gunners over that time period. Before the Leeds win, Arsenal had gone winless in all six fixtures involving Mike Dean in the middle through this season and last, a stretch that started with an infamous 2-1 loss at Old Trafford that saw six Arsenal players booked. Dean has only taken charge of one Birmingham City match this year, their 3-2 win over Coventry City in the FA Cup. That was the first match this season in which Dean did not book anyone. Had Arsenal not qualified for the final, this weekend would have been the North London derby at White Hart Lane. As such, Tottenham Hotspur does not play this weekend. Neither does Chelsea, as they would have been playing Birmingham City. This means Manchester United will quickly make up the game in hand they hold after Arsenal beat Stoke yesterday; they play their first in a string of three road fixtures in the league on Saturday at Wigan Athletic. The following two trips will see United visit Stamford Bridge and Anfield. It's a crucial time period in the title race. Meanwhile, Manchester City sit seven points back of Arsenal in third place, with both even on 27 matches played. They'll host Fulham on Sunday. Liverpool, back in the hunt for European football, travel to West Ham United on Sunday. On Saturday, Aston Villa hosts Blackburn, Everton hosts Sunderland, Bolton visits Newcastle, and Blackpool, fresh off an awesome win over Spurs, will travel to Molineux to take on Wolves. On Monday, Stoke hosts West Brom to finish off the weekend.